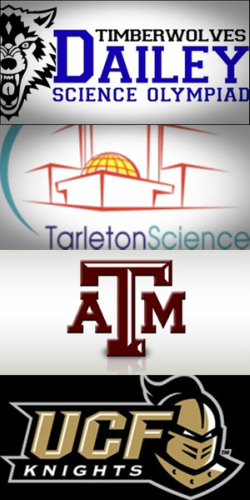 Our students competed in the Texas State Science Olympiad Championship this past Friday-Saturday May 2th-3rd and did an outstanding job representing SST Schools. 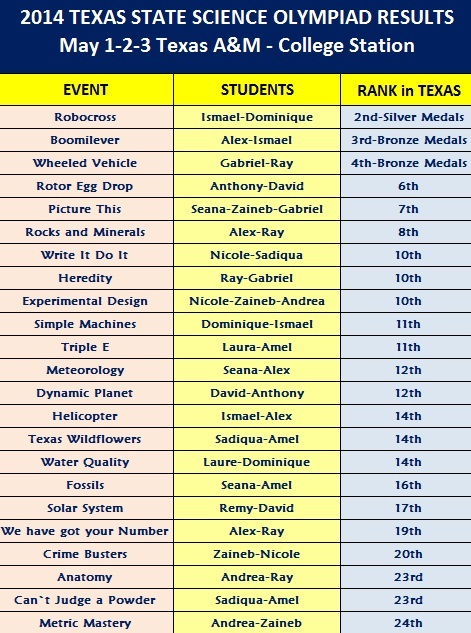 Our team, which consisted of 6th, 7th, and 8th graders, competed against a total of 30 Science Olympiad Teams from all across Texas that included 9th grade students –which raised the bar for us-and our students shined ! Our team won 2 silver and 4 bronze medals in 3 different categories and placed high. Additionally, we placed 5th, 6th, 7th, 8th and 10th in various categories. Also, SST-Discovery was placed 12th, which is the highest,within all charter schools in the competition. Science Olympiad and would like to commend them for their hard work, team spirit, and effort. They have done an outstanding job! This year the competition was tougher and they "stepped up to the plate"
who supported the Science Olympiad Program. Special thanks to the volunteer parents who were with us for 3 days trip.We could not be successful without you. This Science Olympiad season is over,we are looking forward to see the next season. City of Leon Valley Mayor Chris Riley hosted our ​very own Science Olympiad Team and recognized our team members one by one in the City Council meeting.﻿ Very special thanks for her hospitality. 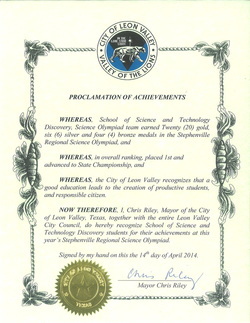 She also gave us a Proclamation for our last accomplishment in the Science Olympiad. It was a wonderful audience, our students will definitely remember this event forever. SST-Discovery Science Olympiad Team won Stephenville Regionals and advanced to State Championships. Our team members became champions in 9 categories. Please see below links for pictures, rankings and individual medal list. WHAT IS SCIENCE OLYMPIAD ? "Because of Science Olympiad, I now know that sometimes, science can be fun. Even though it is a lot of work, all of your studying really pays off on the day of competition...Science Olympiad taught me that teamwork is really important and that everybody on the team has to work hard in order to be successful."